PC application software for editing PS4 game saves! 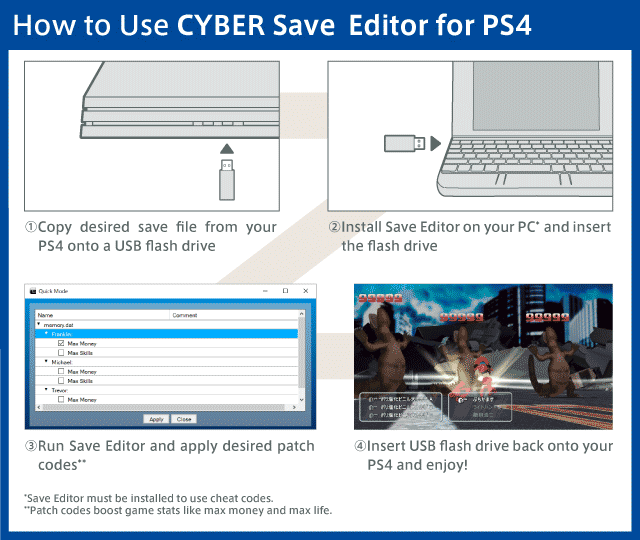 CYBER Save Editor for PS4 is a software application that lets you use “patch codes” or “cheats” to modify your PS4 save data. Effects include unlocking additional gears and secret levels, and maxing in-game stats like money, life, and ammunition without going through the grind. ＊Some titles and versions/regions are not supported. Be sure to check the Game and Patch Code List first. ＊WARNING: Using altered save data online is illegal. Do NOT use patch codes to play online. ● This product uses your PSN ID to access and modify your PS4 save data. ● You must only use your own PSN ID. ● You can edit any data from one PSN account only. *A master account and its sub account are treated as separate accounts. Supports 530+ game titles (US, UK/EU, China, Japan versions) with thousands of patch codes readily available for use. New games cannot be added manually, but we do update the game list regularly and post it on our Newsfeed and website. So, don't worry and leave it to us. ＊Applying patch codes may be slow at times depending on data size and server status. Use the Quick Mode for fast and easy patching. Simply open the dropdown list and apply readily-available patch codes. But if you’re a techie and are up for the challenge, use the Advanced Mode to create your very own patch codes. Why settle for less when you can customize your codes like a true code master! ＊We don’t give tutorials for the Advanced Mode and can’t help solve issues regarding its use either. Turn on "Backup Saves" in the setting to automatically create backups for your save data every time you modify it. You can recover corrupted save data by using the "Restore from backup" option, so you don't have to worry about accidentally losing your data. ＊This is a digital product and all order contents are delivered digitally. This product is a CYBER Gadget original product, not a licensed product of Sony Interactive Entertainment Inc.
All company names and product names on this website are the trade name, trademark, or registered trademark of their respective owners. All products are original CYBER Gadget merchandise.